If you couldn’t already tell from the tens of reviews we have on our site, we have been reviewing pretty much every type of kitchen sink there is out there. This is because we think it would help ensure that no matter the specific needs or preferences of the readers of our site, they will be able to find exactly what they are looking for. And us reviewing the Artisan AR 3120D10 is in line with this idea. It’s one of the more unique products on the market and serves a very specific need that can be difficult to meet. It’s a surprisingly small but premium sink, which makes it ideal for kitchens that are short on space but the owners wouldn’t like to compromise on the quality or looks. With that said, let’s take a more detailed look at some of its most important features below. If you have used a double bowl sink before with the other, smaller bowl not having much of a use, you probably know how much of a wasted space it can be. But it’s certainly not going to be the case with the AR 3120D10-S, which takes up considerably less space than most other sinks out there unless you decide to compromise on the functionality. However, the AR 3120D10-S somehow manages to be just as functional as its other larger counterparts – allowing you to keep and wash just as many pots, pans and other things as them – but unlike them, it doesn’t make your kitchen look crammed due to its size. The AR 3120D10-S is made using 16-gauge stainless steel, which is probably as good as it can get without going for a sink priced significantly higher. However, it brings something even more to the table than the other options you will find in its price range. 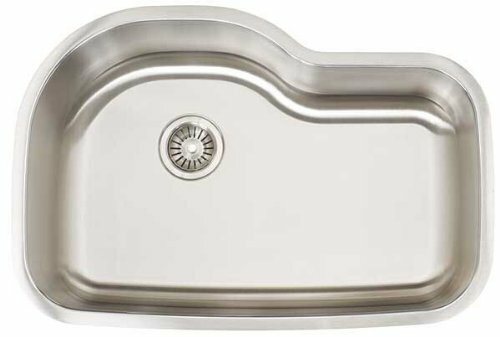 The steel used to make the sink is not only high-quality 16-gauge stainless steel but is also “nickel bearing” stainless steel. If you don’t know what that means, let us tell you that it simply translates to a considerably better quality than general 16-gauge stainless steel without any kind of nickel bearing. While the quality and the nickel bearing stainless steel of the AR 3120D10-S helps it to stand out, its super unique design puts it in a class of its own. You would probably be hard-pressed to find such a unique design AND a great quality in this price range. As some of the customers have mentioned in their reviews, the design is very attractive and doesn’t fail to amaze the guests. It’s also something that would truly add to the overall look of your kitchen, and although the design is more suitable for a modern kitchen than a traditional one, it would work well for many different types of kitchen themes. In other words, the AR 3120D10-S really seems to be ticking pretty much all the boxes, with its small size and great functionality being an exceptional feature combination. As we have been saying above, the great quality or unique design of the AR 3120D10-S doesn’t come with a compromise on the functionality. The cleaning area is large enough to hold all your big pans, pots and trays, and allow you to wash them comfortably. However, something you need to keep in mind is that if you will be using the sink regularly for washing those large items, you may want to consider getting a matching grid for it. It will go a long way in preventing it from getting scratches, which is something sinks commonly get when you use them for washing big items on a regular basis. Finally, it’s also fairly easy to clean, thanks to it being on the smaller side in terms of the size. However, the drainage hole is probably located a bit too far from the area where most of the cleaning would happen, meaning that it may leave quite a bit of leftover stuff away from the drainage hole. But that shouldn’t turn out to be much of a problem as the sink is easy to clean, and a quick wipe of the surface may help get the job done. Simply put, if you want to get the best of pretty much every important feature without going for a sink that costs a bomb, the Artisan AR 3120D10-S may fit the bill perfectly well for you.